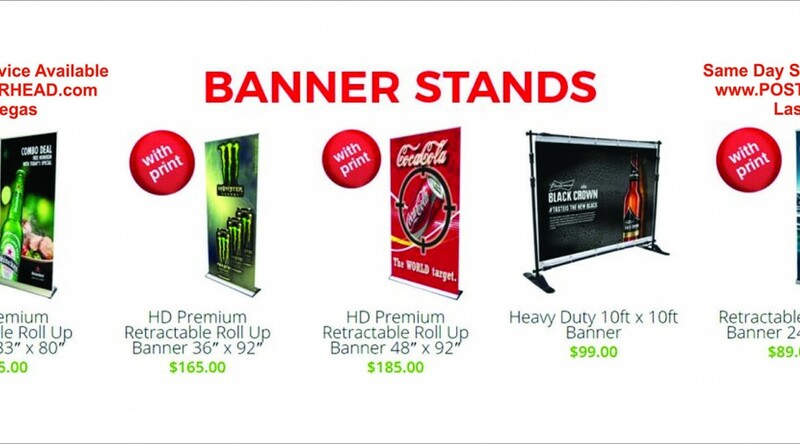 May 16, 2018 Robert W.
Poster banner stands are for events, shows, trade shows and conventions. These poster banner stands are used quite frequently at these events because they are easy to set up, contain a large amount of information or graphics and can be made in many different sizes. Poster banner stands stand alone and can be placed anywhere and remain upright indoors. They can be found in Las Vegas at sign companies that make them like http://posterhead.com/bannerstands/. Poster banner stands can be full color ( meaning you can have as many colors on the graphic as you would like ) contain pictures and logos and even caricatures as seen at https://posterhead.deviantart.com/. Poster banner stands come in many sizes, but the 33″ wide model seems to be the most popular model on the market. These poster banner stands have the adjustable pole feature that allows for the graphic to be adjusted for the stand in order to get that perfect height. Its the preferred banner stand since other banner stands come with a tent pole type stand that holds the banner graphic on the stand but allows for no adjustment, so sometimes it looks a little strange where the graphic starts at the bottom. These banner stands are not expensive. The starting cost of different versions of the poster banner stands is less than $100 and can be used at many different events. All the stands come with a carrying case that allows for easy transportation of the graphic and are also lightweight. The widths of the banner stands vary from about 2ft wide all the way up to around 5feet wide and come with different height abilities. Poster Banner stands can be found at sign and banner companies in the Las Vegas area and be ordered online. In addition, many sign companies offer delivery service to the different venues as well.